Healthy children 2-15 years old. (Ages 9-15 for single applicants). Couples married three years or more may apply; Singles may apply for children age 9 or older. Minimum parent age is 27. Parents must be at least 15 years older than the child to be adopted but not more than 45 years older than the child to be adopted. There are no family size requirements. 1. 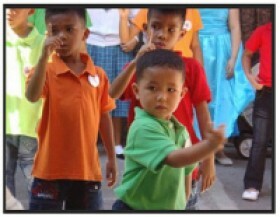 The travel portion to adopt from the Philippines is relatively short compared to other international adoption programs. Travel typically may be completed in less than a week. 2. The process is fairly routine and simple compared to most countries. 3. Once a family is about two thirds of the way through their dossier they can begin looking at waiting children . 4 The Philippines is a great place for single woman to adopt . 5. There are many children waiting , and several sibling groups all longing for you to bring them home. This article was contributed by Children of All Nations, an adoption agency will several country programs, including the Philippines.